I mentioned on Friday that I was baking bread. Well, it turned out FAB-U-LOUS! I think it truly is a no fail recipe - because I am no baker! The only drawback is you have to plan ahead for this bread as it has to rise a loooong time. I started it on Thursday night, let it sit about 14 hours overnight, then turned it out, folded it over onto itself, let rest for 2 hours and then baked it. We had it for dinner on Friday night (instead of previously planned pizza) and again on Saturday for lunch - smothered with butter, sliced garden tomatoes and salt. A piece of cheese on the side and I was in heaven! So, here is the recipe as I gleaned it from the Jim Lahey video I posted on Friday. Cover with plastic wrap and let rest in warmish place (18 - 20 degrees celsius) at least 12 hours. Dough is ready when it has risen dramatically and there are lots of bubbles on the surface. I wish I would thought to take pictures of the steps up to this point. It was hubby who said "Aren't you going to take pictures of it?" that prompted me to do so! Tip dough out onto WELL floured work surface. 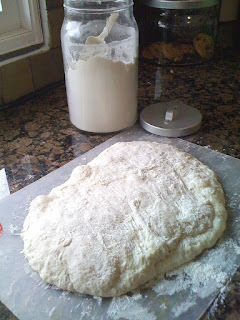 Pat the top with a little more flour and fold itself gently back onto itself. Let rest 15 minutes. About a half an hour before the dough is ready, pre-heat your oven with a round cast iron, pyrex or ceramic casserole dish in it to 450 degrees. Leave the dish in the oven for half an hour, as it has to be screaming hot when you add the dough. Pull the dish out of the oven and flip the dough off the tea towel and into the dish (again, have a look at the video to see the type of pot and how to do the dough "transfer"!) Place the cover on and bake for 30 minutes at 450 degrees. Then, take off the lid and bake for another 15 - 20 minutes uncovered (until the crust gets nice and brown). Slip the bread out of the dish (mine came out so easily and I never greased it) onto a rack or cool countertop and let it cool. 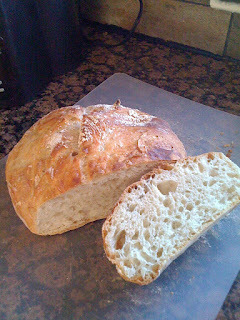 Then enjoy the hard hollow sound it makes when you tap it, slice it to admire the "crumb structure", then eat it up! I don't kow if this bread will become our daily bread...it would take a lot of planning to make sure you had a loaf ready every couple of days...but I think it will become our weekend bread. It's great to include with a casual Friday supper and for weekend lunches. 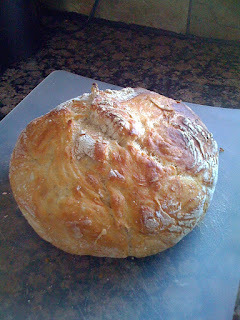 I think I will still ask for a breadmaker for Christmas, but this will be a recipe I definitely will turn to again.